Central Vacuum Systems need attention too! Have your central vacuum system serviced for maximum efficiency. We service all brands of central vacuum systems. Welcome to Vacu-Maid of the Lehigh Valley! We have been in business since 1972 and look forward to serving your central vacuum needs. 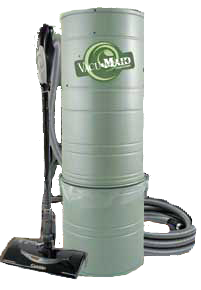 Whether you have a home already built or new construction we can install a Central Vacuum System in your home or business. We specialize in pre-existing homes. Call for a free estimate 610-797-6542 or contact us here. Vacu-Maid of the Lehigh Valley provides parts and service for all brands. We are VDTA certified installers. We serve Allentown-Bethlehem-Easton and surrounding towns. We are excited to introduce the Hide-A-Hose system which can be installed on any central vacuum system. The hose disappears into the wall so there is no need for storage. The problem of what to do with the hose when you are finished vacuuming has been solved! Check out the video here. There is a wonderful new product for maintaining your central vacuum system called TornadoPower! These Central Vacuum Maintenance Cloths are the do-it-yourself solution for central vacuum system care. You can see a demonstration of it here. You can purchase these special cloths in our Shop. If you need parts please visit our Shop, and if you'd like to troubleshoot a problem before you call us, please visit the Tips page. Testimonials can be found here.